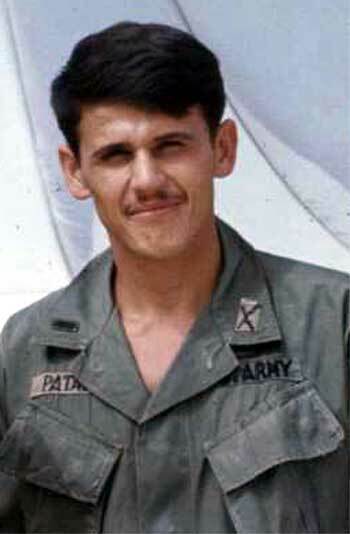 1LT A. Michael Patacca joined C 2/5 Cav as the 1st Platoon Leader, after having done his "on the job training" with Company A. 1st Platoon was assigned a reconnaissance mission, while the remainder of the company stayed in the area of the previous night's position. One fire team of 1st Squad was on point, while Jay Phillip's fire team was next in line. 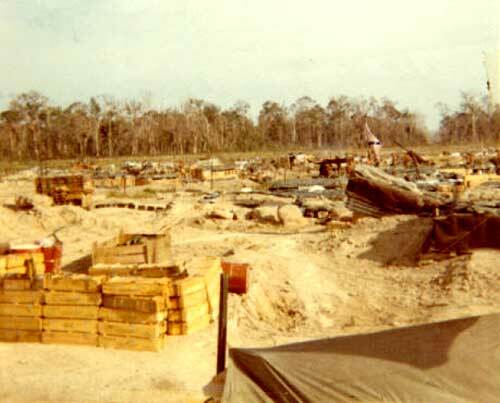 The undergrowth in the area was passable, and the platoon moved parallel to and 20 meters or so from a trail that went through the company position. They had gone only about 100 meters when the point man found a blue wire. (Webmaster note: Blue wire was used by the NVA for both ground communication and as a trip wire for booby traps.) As per good tactics, the platoon halted while a team went forward to cut the wire. "He had taken six or seven rounds in the head and upper torso, with one round cleanly through the neck. He did not speak. Although 1SG Soloway's journal says we took "heavy automatic weapons fire", that is not what I recall and no one was hit except for Charles by the ambusher's fire. After the medic had a quick look, he and I carried Charles back down the trail for a short distance, where two or three additional troops aided us in carrying him to the clearing, secured by the rest of the company. Once at the clearing, I held Charles' head while the medics continued to work, although probably fruitlessly. I remember that I became angry that it seemed to be taking so long to get a DustOff bird in, and either the 1st Sergeant or one of the Platoon Sergeants told me to calm down. I think Charles was dead before the chopper arrived. Later, when we moved back through the area of the ambush, I remember that we identified a vacant "blind" in a tree near the trail as the likely spot from which the fire had come. The narrative on the site indicates that gunships and an air strike were called in and that we later found one dead NVA with weapon. 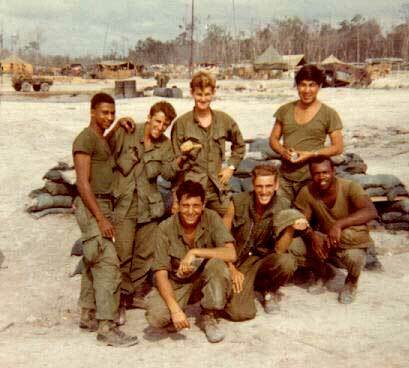 I don't recall any of that, but I think second platoon actually had point when the move re-commenced, so perhaps they found the NVA. 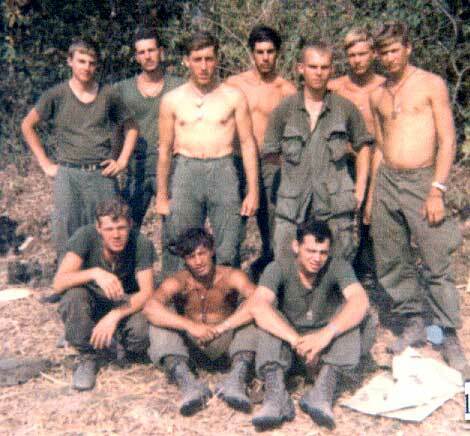 I did not know Charles well, as I had only been with the Platoon a short time, but I remember him as something of a "country" boy, with a very laid-back friendly demeanor. I'm sure he didn't realize he was placing himself in mortal danger by resting near the trail we were trying to avoid walking down. I believe Charles came to Tall Comanche on the same day as I did in mid October 1968. He had a very sick parent so he went back to the States on leave for a long time. My recollection was that he had only rejoined us about a week earlier, so that, along with his quiet nature, left most of us not knowing him too well. I also thought he came from Arkansas. 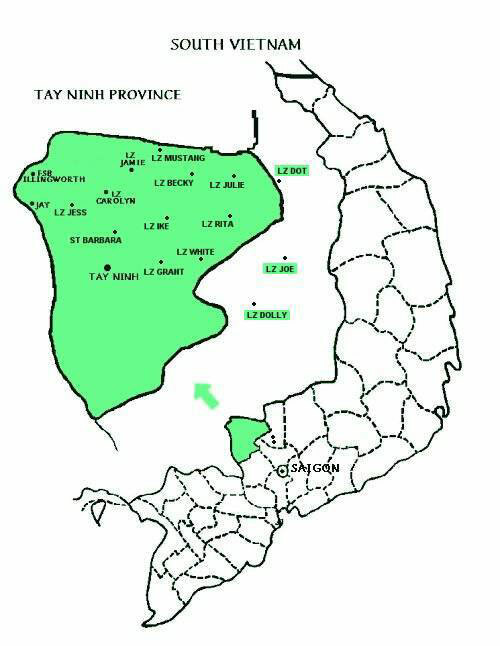 As part of the 1st Cav's Navajo Warhorse area of operation, Comanche moved from LZ Jake to Cu Chi, then on to LZ Terry, near the Angel's Wing. 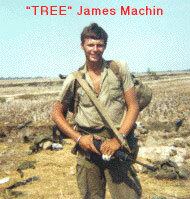 While at Cu Chi, James "Tree" Machin had time to have his picture taken. Front row from left: Unidentified, "Doc" Bovie, Charles. Anyone knowing the names of the unidentified troopers, please contact the Webmaster. Anyone knowing the full identity of those partially named, please contact the Webmaster.